The 28-year-old Argentine beats Christian Garin in Sao Paulo. 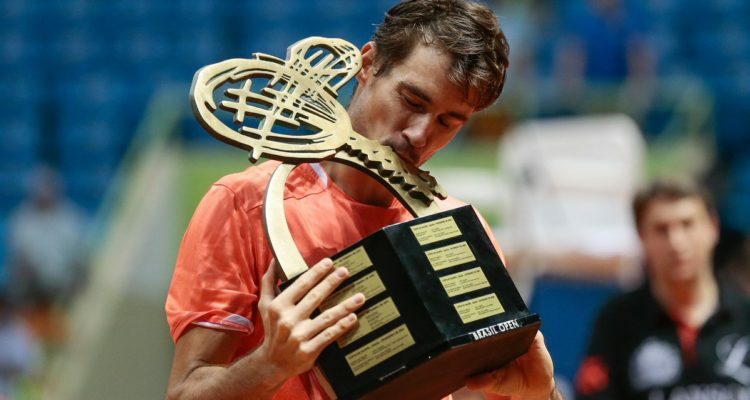 Guido Pella clinched his first ATP Tour title, winning the 2019 Brasil Open in Sao Paulo. The No. 3 seed from Argentina defeated Christian Garin of Chile 7-5, 6-3 in Sunday’s singles final of the clay-court event. Pella saved six of the seven break points he faced, capitalizing on four of his seven own chances to secure victory in one hour and 23 minutes. Pella earns $94,830 in prize money as well as 250 ATP-Ranking points. On Saturday, Federico Delbonis and Maximo Gonzalez took the doubles title. The all-Argentine duo beat the all-British combination of Luke Bambridge and Jonny O’Mara 6-4, 6-2. The final lasted 61 minutes. Delbonis and Gonzalez leave Brazil with 250 ATP Doubles Ranking points and a share of $31,300. This entry was posted in ATP Tour, ATP Tour News and tagged ATP Tour, Brasil Open, Guido Pella, Sao Paulo.